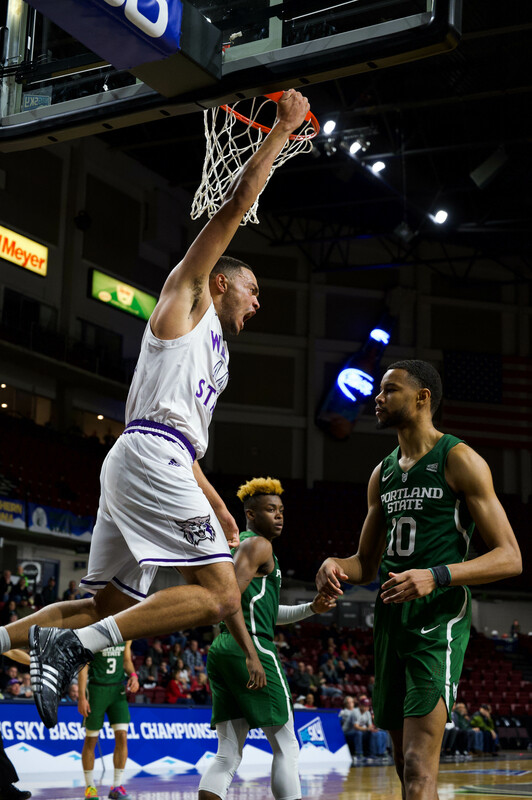 Fans in attendance for the Weber State University men’s basketball team’s second-round game of the College Insider Tournament not only witnessed a 78-57 win over the U.S. Air Force Academy — they saw history made. Late in the second half, Scott Bamforth became the all-time leading 3-point shooter in WSU school history, passing Damian Lillard. Fans in attendance also saw WSU set a new record for most wins in a Big Sky Conference season with its 28th win of the year. Kyle Tresnak opened things up offensively with a hook shot from the middle of the paint to give WSU an early 2-0 lead on its first possession of the game. Two minutes later, Bamforth pushed the lead to five, hitting his first three of the night. 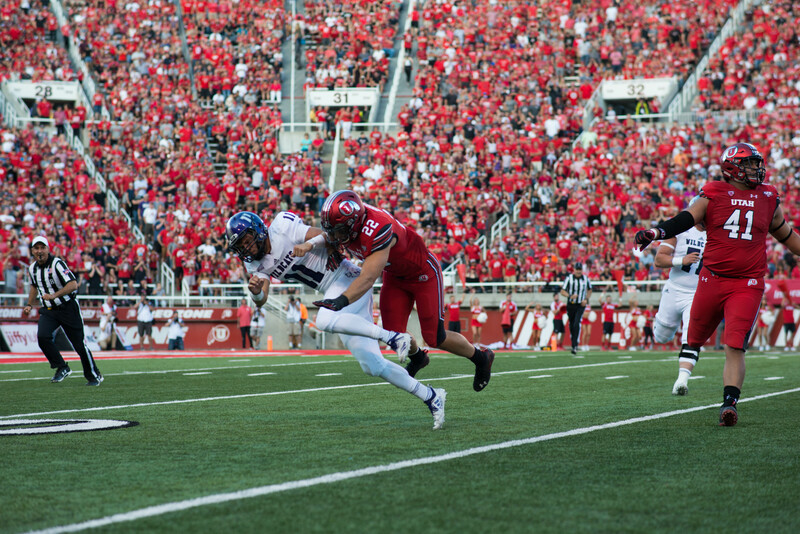 Early in the game, the Wildcats’ offense troubled the Falcons. Three times in the early minutes of the game, WSU passed the ball around the outside of the arc, stretching the USAFA defense, before going inside to Tresnak. The Falcons kept the game close and, with 12:34 left in the half, they cut the WSU lead to two, thanks to a 3-pointer from Cameron Michael. A minute later, USAFA tied the score at 13. The Wildcats pulled away again and opened up their biggest lead of the game so far at the midway point of the half, going up by seven points. Royce Williams then hit a three to push WSU’s lead to 10 with eight minutes left in the half. Just before the break, the Falcons hit a three to cut the Wildcat lead to six points. At the half, WSU held a 36-32 lead. In the first half, Tresnak led WSU with 10 points. The Wildcats shot 56 percent from the field in the first half. USAFA was led by Taylor Broekhuis, who had 12 points in the half. Tresnak started the second half in the same way he started the first. He hit a turnaround hook shot from inside for the Wildcats to push their lead to eight. Bamforth then hit back-to-back threes, which elicited one of the loudest cheers of the night from the crowd at the Dee Events Center. A few minutes later, Bamforth hit another three to tie Lillard for the most threes in school history. After Bamforth tied the record, he missed multiple 3-point attempts in a row. With every attempt, the cheers rose as the crowd waited to see history. Every miss was greeted with a groan. With 4:40 left, Bamforth finally found the bottom of the net. As the three fell, Bamforth received a standing ovation from the crowd. At the next timeout, he was met at half-court by his entire team, who gathered around him to congratulate the senior. Bamforth said he was happy to break the record, but that it wasn’t something weighing on his mind throughout the latter half of the season. Frank Otis had back-to-back plays, which brought the crowd to their feet. First, with the ball down low in the post, he faked left, spun around his defender, then laid the ball in. On the ensuing possession, Otis came up with a block down low, which again garnered raucous cheers from the crowd. In the last quarter of the second half, the Falcons cut WSU’s lead back to single digits, cutting the score to 62-53 with seven minutes left. But as the game drew to a close, the Wildcats pushed the lead back to double digits and closed out the game to advance to the third round of the tournament. WSU will take on either the University of California, Irvine or Oral Roberts University on Wednesday at the Dee Events Center.